Shiny Friday is here. Today we'll leave our lovely interiors for a while and enjoy some of Martha Stewart's great ideas for gardens, plants and pots. Have fun! Pansies and their cousins violas are among the most popular garden plants, adding color, whimsy, and grace to a bed, a border, or steps. 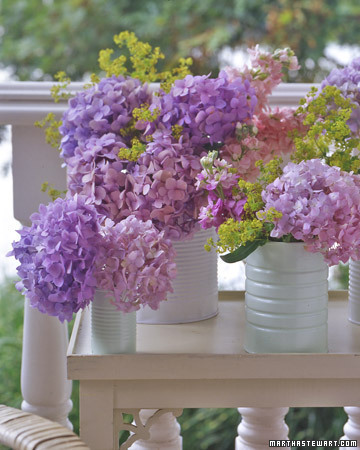 Bushel baskets from the garden center make charming and inexpensive containers. Their wooden slats provide built-in drainage, and they can be recycled after the plants have had their season in the sun. As autumn draws to an end, the entire basket can be composted once the wire handles are removed. 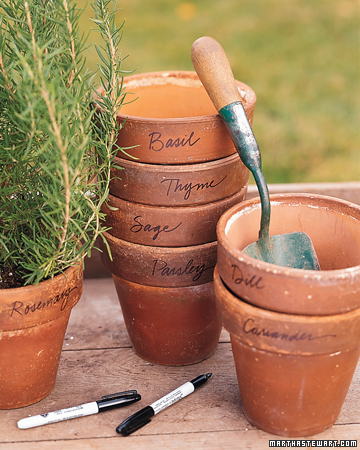 Give each herb its own personalized pot, and you'll never snip the wrong sprigs. 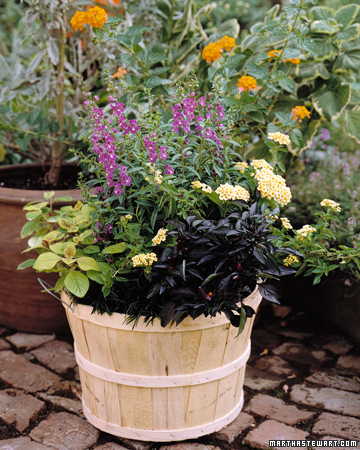 Use beach pails to hide less attractive flowerpots within. 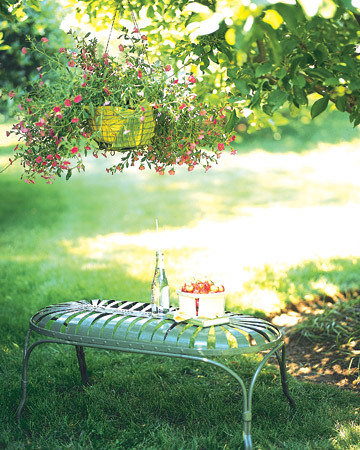 Create custom cabinetry in your garden shed with vintage wine crates. 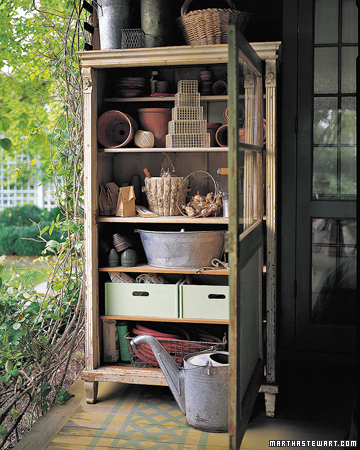 A vintage wooden cupboard provides handsome storage for gardening supplies. 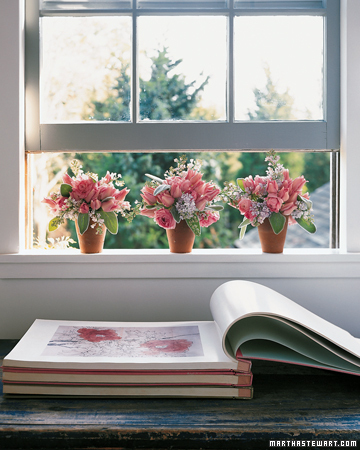 Flower pots and windowsills, a perfect match. Dogwood branches are arranged in an antique Japanese wicker backpack. Various English hybrid delphiniums, orange Alstroemeria 'Ligtu,' blue Geranium 'Nimbus,' and white-flowering Clematis recta 'Purpurea,' which adds its dark foliage to the mix. Along a drive, Lombardy poplars soak up most of the water. Spring-blooming bulbs -- Spanish bluebells, Dutch iris, and daffodils. Morning haze heightens the pinks of these roses. Garden at Martha's Turkey Hill home. 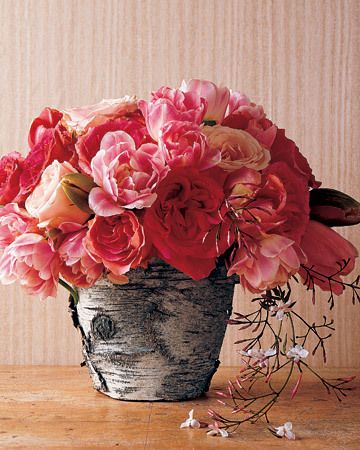 Create a rustic, richly textured presentation by placing a vase of lush flowers in terra-cotta pots adorned with tree bark. 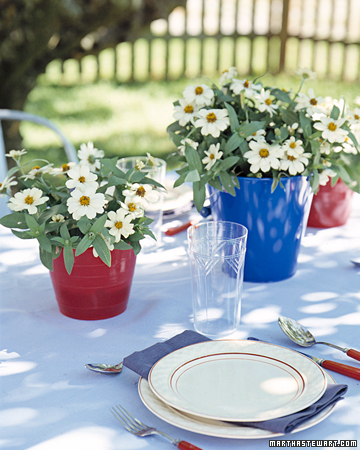 All images from Martha Stewart. I have linked this post over at Jerri's Friday Favourites Party, Melissa's The Inspired Room and Laurie's Saturday Favourite Things. Thanks once again Jerri, Melissa and Laurie! What gorgeous photos! I love the wine crates and the cabinet photo, just beneath the crates. Thanks for sharing. Dropping by from The Inspired Room. Come see what has inspired me in Blog Land, and don't forget our giveaway ends Saturday night - so be sure to register at AtticMag! Thanks for stopping by Allison, I'll be right over! Justo! me olvidé de contarte, me compré dos plantas preciosas... una bromelia (asi http://www.jardineria.pro/wp-content/uploads/2008/06/bromelia.jpg pero es mucho más linda la mía) para adentro y para el balcón una genista "Porlock" (http://www.altiflor.it/admin/piante/genista18) que está bastante grande y parece que crece mucho! así que veremos. These are all beautiful indeed! 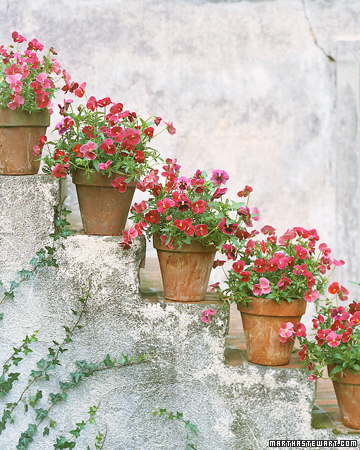 I love the potted plants on the stairs! Would the hosta leaves lining the plants stay alive? I love the clothespin. I do the pots on the atairs thing..
Oh my! I haven't been to ms.com in awhile. I see I need to get over there and look around! The pink and red pansies and violets! WONDERFUL. The wine crates too chic. And, the lamb's ears, tulips, and lilacs in the window sill. Ohhh how pretty! 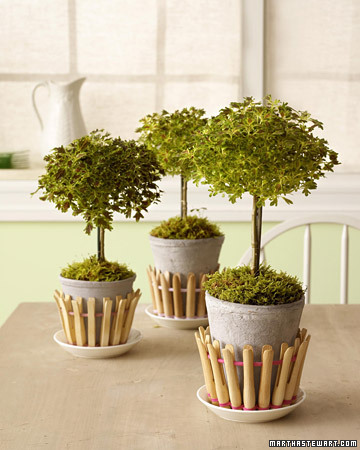 Thanks foe these images, just what I needed to get inspired for my table this week. 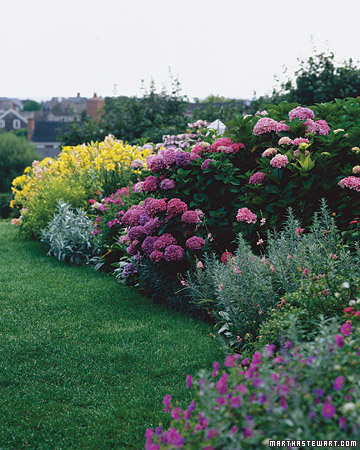 I love Martha, and I love gardens... the pics you chose are gorgeous! Thanks for sharing! Great photos. I love the plants on the stairs and the cupboard full of gardening supplies. Thanks for linking up for Friday Favorites!